The Grand InterContinental Seoul will open a new modern style bar & lounge, 'BLUSH' on April 20, 2007, for trend setters seeking a cutting edge lifestyle. This new bar & lounge will replace Hunter's Tavern—popular for over 18 years among business executives. 'BLUSH' is a place for young professionals and others who enjoy new lifestyles and have a passion for new culture. The interior design concept is "Contemporary Modern Design." 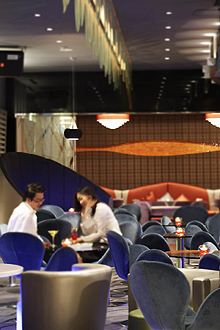 A bar with sophisticated color, dynamic images, and sound effects and trendy music will offer a unique experience. Of note is the interior décor which has been inspired by flowers and trees in their natural settings creating a truly guest-friendly ambiance. Glamour, extravagance, and luxury assist in describing the design of this stylish bar & lounge, with two separate bars, and five stirring private rooms. The culinary selection for the BLUSH bar and lounge, as envisioned by Executive Chef Ivan Susanj, will be a selection of very fine dishes created to match, complement or contrast with, the amazing cocktail collection and beverages with like-minded people, where you can appreciate trendy music, where you can experience trendy style, and where interesting events and various social gatherings take place-Welcome to the world of our new bar & lounge! For Details and Inquiries call (02) 559-7602.